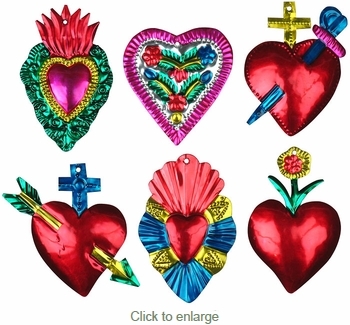 Our variety of painted tin Milagros heart ornaments are all handcrafted by metal craft folk artists in Mexico. The tin is hand cut, punched and etched, then carefully individually painted to bring a vibrant feel to your holiday or special occasion d�cor. These colorful heart ornaments look beautiful hanging on a Christmas tree and also make wonderful stocking stuffers for friends and family this holiday season.